From a bird’s eye view, the dream world of Sanjay Leela Bhansali’s Saawariya looks like a vague cubist painting, with houses in hues of blue and green. And it is a world where the sun doesn’t shine.Not at least in the course of the story.Based on Fyodor Dostoevsky’s short story “White Nights”, Saawariya is like a dark and surreal fable that enchants you with its visual beauty, but doesn’t touch you where it matters the most – heart.And the reason for this is that Sanjay Leela Bhansali gives more importance to creating the right ambience rather than capturing the essence of the story. 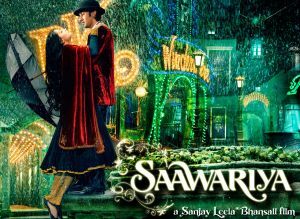 “Saawariya” is a timeless story of two young star-crossed lovers whose passions almost consume their will to the brink of self-destruction.In this eternal tale of an ode to romance, stand two lonely souls whose childlike innocence and candour only obscures their inner turmoil, anger, anxiety and desperate wait for love.An artist, a free spirit, an idealist and dreamer, Raj, is certain that he has found his ultimate dream when he arrives at a quaint picturesque town. A place surrounded by mountains, shrouded in mist and enveloped in beauty, mythical enough to be a painter’s vision or a poets memory.However, destiny paints a different picture for Raj. One silent bright and starry night, he spots a mysterious girl draped in black, standing alone at a bridge.This chance encounter introduces him to Sakina, a shy and quiet, melancholic and enigmatic girl who continues to intrigue him. Thus follows the beginning of a new friendship, where Raj with his most charming ways and an undying spirit tries to win Sakinaâ€™s heart.Raj is unable to accept her haunting past and their friendship pulls him into a whirlwind of desire, madness and romance.Through Raj and Sakinaâ€™s journey together, we are reminded of the fragility of the human heart.In the coupleâ€™s anguish and test of faith, is revealed the power of unconditional love through a thousand layers of tumultuous emotions.